Why would I need self storage in Margate, FL? There are a variety of reasons why you might need self-storage in Margate, FL. How much is a storage unit in Margate, FL? The cheapest storage unit in Margate, FL is $44.00 per month. What size storage units do you have available in Margate, FL? In Margate, FL we have sizes that range from 4'x5' to 15'x30' to suit your storage needs. How much is it for a 4'x5' storage unit in Margate, FL? The cheapest 4'x5' storage unit in Margate, FL is $44.00 per month. Margate is a bustling town in Broward County, Florida, about 12 miles northwest of Fort Lauderdale. It's considered a suburb of the Miami metropolitan area, drawing new residents who enjoy a small-town lifestyle but are within easy reach of big-city amenities. Margate is a relatively new city, with a fairly recent incorporation in 1961. Until the 1950s, it was mostly made up of Everglades swampland and small farms. By 1955, an influx of new people drove rapid development, changing the area dramatically within the short span of a decade. The first half of the city's name ("Mar") comes from the name of the city's founder, Jack Marquese, while the "gate" part of the name stems from Margate's position as a "gateway" to the western side of Broward County. Interestingly, according to the original plans for Margate, it was supposed to be a city of only 35,000 people. Today, well over 50,000 people call Margate home. The unemployment rate in Margate is considerably lower than the national average, and its job growth forecasts a bright future for incoming job seekers. 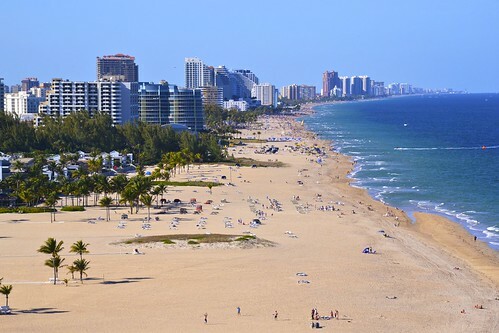 It's fairly common for Margate locals to commute to nearby Fort Lauderdale for work, since its proximity provides easy access to the city's wide range of industries and businesses. In the Fort Lauderdale area, you'll find a variety of major employers, including Nova Southeastern University, American Express, Auto Nation and Ultimate Software. Margate does not have a school district of its own. Rather, the Broward County Public School District takes the lead in providing education to Margate's children. The school district is the sixth-largest in the United States and it has more than a quarter of a million students. Utilities: Florida Power & Light (FPL) provides electricity to the Margate area, while the city oversees water and sewer services. Garbage and Recycling: You can expect your trash to be collected twice per week and recyclables picked up once a week. Bulk-item pick-up is also provided. Transportation: Margate Inter-City Transit is a free-of-charge shuttle system that runs during the day, Monday through Saturday. You'll find a range of townhouses, condominiums and single-family dwellings for sale in Margate. Margate is around 10 miles from Fort Lauderdale but generally far more affordable, making it a popular home base for commuters. The median home price for Margate is fairly in line with national averages, and less than the average for the Miami-Fort Lauderdale metro area as a whole. Our lowest priced units in Margate, FL average $44.00 per month. 74 people have reserved units in Margate, FL in the past 30 days. There is 1 location within Margate, FL's city limits. There is 1 location in Margate, FL that offers AC and Heating features.